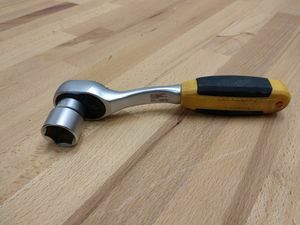 A socket wrench is a modular tool that can be set to apply torque in one direction but rotate freely in the other. Direction is changed by turning a lever or disc on the tool's head. Square drive sockets are required as "bits". Sockets are locked in place in some models (including our yellow one), requiring the user to push a pin on the back of the tool's head to insert or remove them. The most common drive sizes are 3/8", 1/4" and 1/2". An adapter for 1/4" hex bits is also available. Pass-through sockets may be cool to have, but require a special wrench. 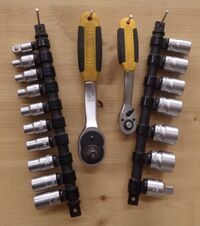 A torque wrench (Drehmomentschlüssel) is necessary for many vehicle repairs. This page was last edited on 6 March 2019, at 00:55.